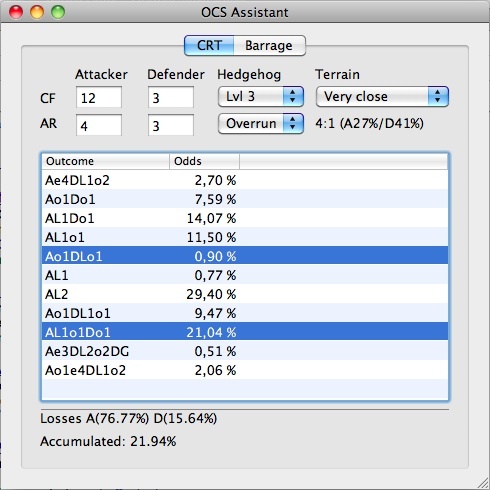 This nifty tool is an odds calculator for the OCS 4.0 CRT and Barrage Tables. Enter the Combat Factors and Action Ratings of the attacker and defender, manually modified for any applicable DG, terrain, OoS, or other circumstances. Put in some other values (hedgehog level, terrain and whether this combat is a regular combat or an overrun) and view the odds for different outcomes in the list below. The odds are adjusted for possible defender/attacker surprise shifts. The list below the entry area should be self-explanatory (it shows you the odds for every possible result). Select multiple rows in the table to see the accumulated odds for acheiving any selected result. Just below the box (Losses) you can see the odds for getting at least a 1 step loss on the attacking or defending side. The second page of the application (click Barrage) is a simple calculation of the odds for the different possible results from an attack on the barrage table. 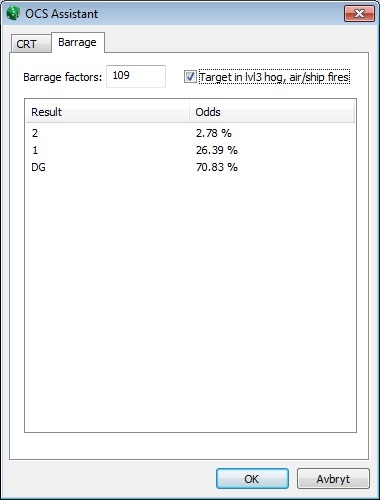 Input the barrage factors (manually modified for target density, terrain, etc), check the box if your target is in a lvl 3 hedgehog, if you don't have a valid spotter or if ship or air fires (see the barrage table and the rules for more on this), and check out the odds in the list below. This tool is freeware. If you have any comments, feel free to contact the author using the messaging feature of BoardGameGeek, username: MatGot.